The Brandenburg Gate (Brandenburger Tor) in Berlin is one of the first landmarks that come to mind when thinking of Germany. It is not just a symbol for the city, but for the country. 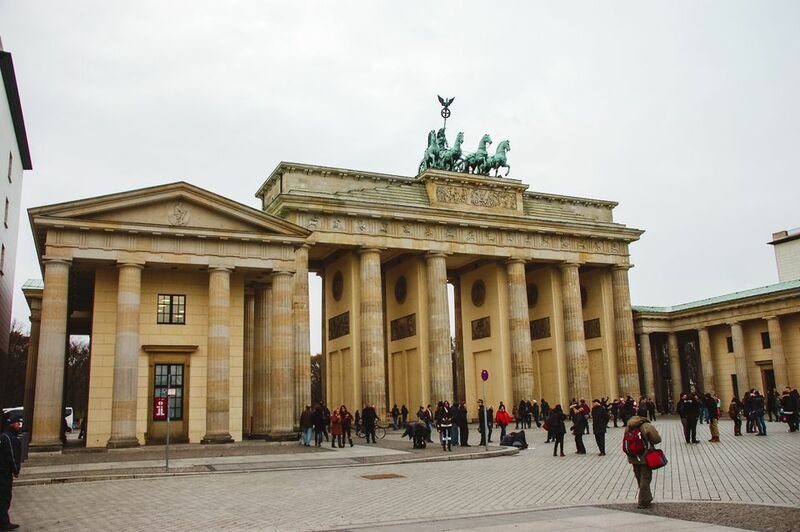 German history was made here – many different times with the Brandenburg Gate playing many different roles. It reflects the country's turbulent past and its peaceful achievements like no other landmark in Germany. Commissioned by Friedrich Wilhelm, the Brandenburg Gate was designed by architect Carl Gotthard Langhans back in 1791. It was built on the site of a former city gate that marked the start of the road from Berlin to the town of Brandenburg an der Havel. The design of the Brandenburg Gate was inspired by the Acropolis in Athens. It was the grand entrance to the boulevard Unter den Linden which led to the (currently being rebuilt) palace of the Prussian monarchs. The monument is crowned with the sculpture of the Quadriga, a four-horsed chariot driven by Victoria, the winged goddess of victory. This goddess has had a journey. In the Napoleonic Wars in 1806, after the French forces defeated the Prussian army, Napoleon's troops took the sculpture of the Quadriga to Paris as a war trophy. However, it still did not stay in place. The Prussian army reclaimed it in 1814 with their victory over the French. More than a hundred years later, the Nazis would use the Brandenburg Gate for their own means. In 1933, they marched through the gate in a martial torchlight parade, celebrating Hitler's rise to power and introducing the darkest chapter of German history. The Brandenburg Gate survived World War II, but with serious damage. The site was reconstructed and the lone remaining horses head from the statue was preserved in Märkisches Museum. The Brandenburg Gate became infamous in the Cold War when it was the sad symbol for the division of Berlin and the rest of Germany. The Gate stood between East and West Germany, becoming part of the Berlin Wall. When John F. Kennedy visited the Brandenburg Gate in 1963 the Soviets hung large red banners across the gate to prevent him from looking into the East. In 1989, a peaceful revolution ended the Cold War. A confusing series of events led to the great Berlin Wall being breached by the people. Thousands of East and West Berliners met at the Brandenburg Gate for the first time in decades, climbing over its walls and perching atop defiantly as David Hasselhoff performed a live show. Images of the area around the gate were featured prominently by media coverage around the world. The Berlin Wall had fallen overnight and East and West Germany were reunited. Brandenburg Gate was re-opened, becoming the symbol of a new Germany. The gate was restored from 2000 to 2002 by the Stiftung Denkmalschutz Berlin (Berlin Monument Conservation Foundation) and continues to be a site of inspiration and photo ops. Look for the large Christmas tree from late November through December, mega-stars performing by it for Silvester (New Year's concert) and tourists year-round. Today, the Brandenburg Gate is one of the most visited landmarks in Germany and in Europe. Don't miss the site during your visit to Berlin. How Much Do You Know About London Postcodes?